This is my favorite ice cream. I made it for the first time a couple of years ago and really have not changed it much since. 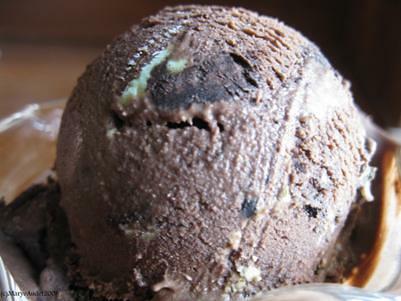 It is rich, deep-dark-chocolate…..creamy…and just when you think you can’t take anymore chocolate flavor you bite into a mint oreo. Intense. Attention Getting. And Blue Bell doesn’t make it. By now, I hope that you have figured out that my food philosophy is that I would rather have a teaspoonful of really good food than a dump truck full of mediocre food. That means that I don’t do low fat. There are other blogs that do it so much better than I do…and frankly, we don’t eat low fat. I have trouble keeping weight ON my family. They are just that active. So, don’t try to substitute anything in this and think that you will get the same product with lower fat “healthier” ingredients. You won’t. Makes about 1 gallon or so? Heat 1 cup heavy cream until bubbles form around the edge. Stir in chopped chocolate and cocoa. Stir until smooth. Set aside to cool. Beat egg yolks until light. Add sugar gradually beating all the while. Add vanilla and salt. Slowly add the chocolate and continue to beat. Add in the half and half. Whip the cream until it is thickened and soft peaks form. Fold into the chocolate mixture. Pour into ice cream maker and freeze according to manufacturer’s directions. 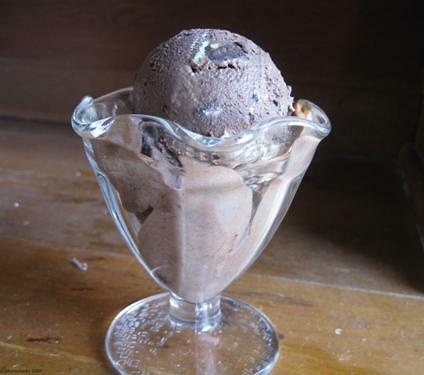 When ice cream hs begun to freeze but is not totally frozen fold in the oreos and turn the ice cream maker back on to finish churning the ice cream. When done, remove dasher and pack tightly. Freeze for at least 4 hours or overnight. Soften slightly before serving. Oh man, Marye! That’s incredible!